Please keep a look out for more Antique Furniture coming soon, we usually list old box/chests and Unusual Pieces of Antique Pine every week! Please take a little moment to read our description. 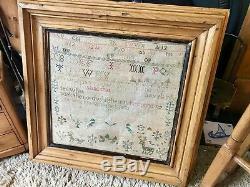 Fabulous Antique Victorian Sampler in Pine Frame. 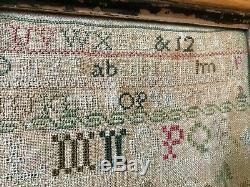 Stunning Fantastic Old Sampler in old Pine Frame. Totally Original Guaranteed over 100 years old! Pine frame has Hand cut Mitre Joints! If you live in the Scottish. We can get it to you! Here for sale at Liverpool Antiques we have a large selection of Victorian and Georgian furniture. This piece is truly stunning, it is guaranteed.
" 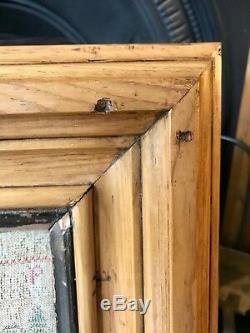 Completely Original with old wood frame". 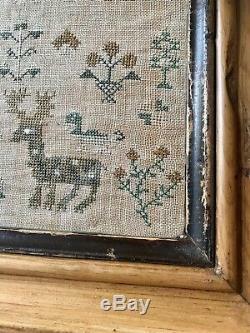 The timber that has been used for this sampler frame is yellow pine and has been repurposed into a frame with beautiful figure. We can make any frame size you want using our supply of original Georgian and Victorian architrave mouldings and supply new or old mirror glass or just leave blank for a painting, sampler or canvas. 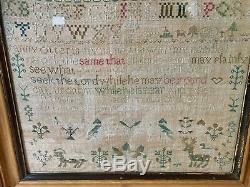 This sampler is genuine and has been re-framed using contemporary timber. 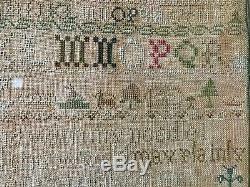 It is a beautiful work by Fanny Otters, aged 9 and was made c1850. 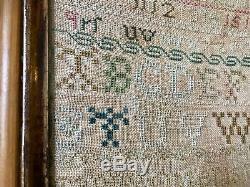 It consists of lines of numbers, both script and capitals and large capitals. The numbers are from 1 to 22 and has a lovely mixture of trees, animals and fruit. There is fading in areas but also good colour. Fanny Otters is my name and with my needle I work the same, that all the world may plainly see what care my parents took of me, seek the lord while he may be found, call upon him while he is near, and when the bell for me doth toll, lord jesus christ receive my soul, Fanny Otters Aged 9. This timber has been fully restored and has aged wonderfully with all the years of use, it has now been polished to a wonderful shine. 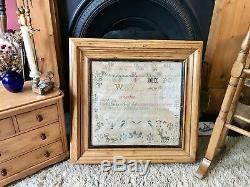 This frame is in fabulous condition, like all the furniture we sell clean and tidy with some age related use marks. The glass is also old and does show signs of ware with some blemishes and light scratches. 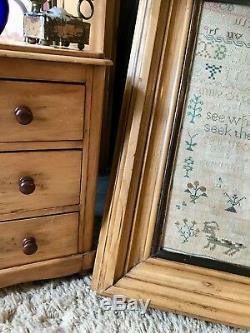 The years of use have really added to this woods character, which have developed into a fabulous rich all over weathered look and feel and it really sets off the old sampler it frames. This has been fully restored and has been polished using traditional bees wax. This is a truly stunning and wonderful quality piece, hand made and full of character, with charm and in fantastic condition. We would be happy to deliver this piece within 50 miles of Liverpool for a small charge or you may collect yourself for free! Please feel free to ask any questions and take a look at our many other items for sale. "CONTACT DETAILS" , you just need to look for them! 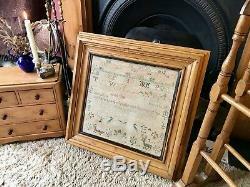 The item "Fabulous Antique Vintage Victorian Sampler in Pine Frame" is in sale since Sunday, May 20, 2018. 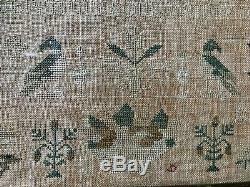 This item is in the category "Antiques\Fabric/Textiles\Samplers". 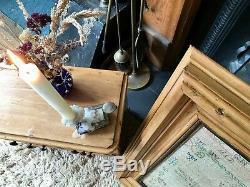 The seller is "liverpool_antiques" and is located in Liverpool, Merseyside. This item can be shipped to United Kingdom, Austria, Belgium, Bulgaria, Croatia, Cyprus, Czech republic, Denmark, Estonia, Finland, France, Germany, Greece, Hungary, Ireland, Italy, Latvia, Lithuania, Luxembourg, Malta, Netherlands, Poland, Portugal, Romania, Slovakia, Slovenia, Spain, Sweden, Australia, United States, Canada, Japan, New Zealand, Israel, Hong Kong, Norway, Malaysia, Mexico, Singapore, South Korea, Chile, Antigua and barbuda, Indonesia, Taiwan, Bangladesh, Belize, Bermuda, Bolivia, Barbados, Brunei darussalam, Cayman islands, Dominica, Ecuador, Egypt, Guernsey, Gibraltar, Guadeloupe, Grenada, French guiana, Iceland, Jersey, Jordan, Cambodia, Saint kitts and nevis, Saint lucia, Liechtenstein, Sri lanka, Macao, Monaco, Maldives, Montserrat, Martinique, Nicaragua, Oman, Pakistan, Peru, Paraguay, Reunion, Turks and caicos islands, Aruba, Saudi arabia, South africa, United arab emirates, Ukraine.